Robertson College Massage Therapy Students and Co-Award Winners of the 4th Annual Research & Interpretive Studies Competition. 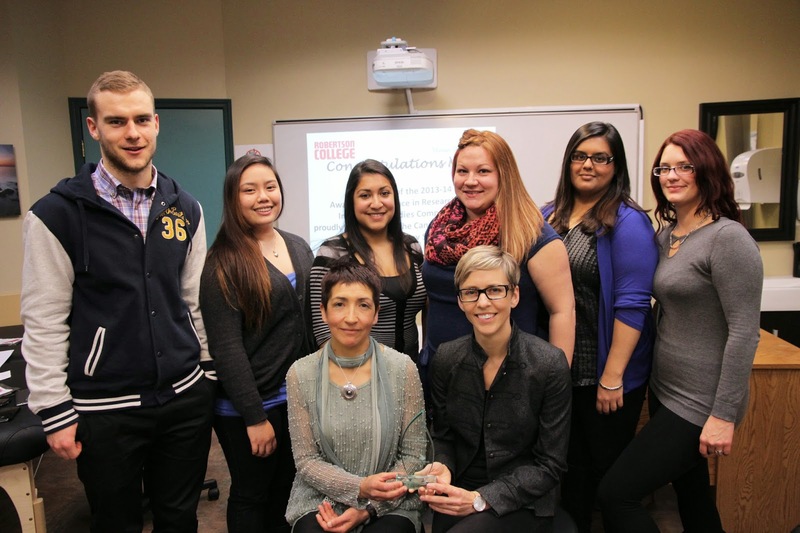 A research paper prepared by a team of Robertson College Massage Therapy students has won a national research award sponsored by the Canadian Council of Massage Therapy Schools (CCMTS). Students Ashley Calder, Mario Funk, Patricia Salceda, Rebecca Zavala, Sukhminder Sidhu and Rachael Dupuis were co-award winners of the 4th Annual Research & Interpretive Studies 2013 – 2014 Competition for their research paper on the “Effects of Myofascial Release on Caesarian Section Tissue Healing and Pain Management Following Caesarian Delivery: A Preliminary Study”. Led by Marianela Lopez, Mentor for the Research and Literacy Course, in collaboration with Emah Christiansen, Robertson College Massage Therapy Program Coordinator, the research process not only challenged our students on their academic understanding of the education they received here at the college, it also provided them with the valuable experience of preparing a high calibre research study. The research process was able to enhance their knowledge and provide them with the opportunity to apply what they have learned in the classroom to real life scenarios. ”Our goal is to ensure that our graduates will be recognized, respected and well prepared to maintain the health and well being of their clients. This achievement in research sets these bright young students on the right path towards attaining these goals. We are very proud of this accomplishment and I personally commend the dedication of our students and Mentors alike.” Debra Chartier, Faculty Head of Allied Health, Robertson College. Massage therapy not only reduces stress, increases mobility and increases circulation, it can also help bring about pain relief and healing. Like the research our students conducted, massage therapy can be used to encourage healing for different conditions. If you are interested in becoming a Massage Therapist, contact us now to learn more about our program.